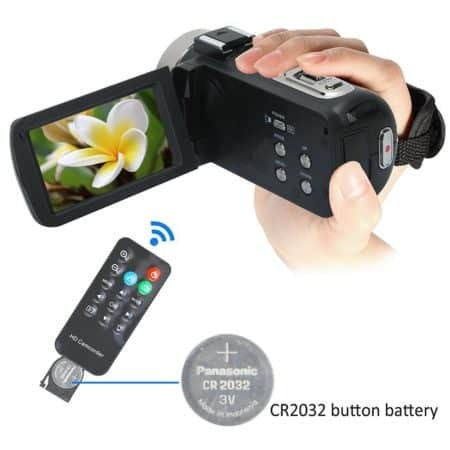 A lot of people think that their cell phone can record footage just as well as a camcorder can. A lot of people, it turns out, are mistaken. 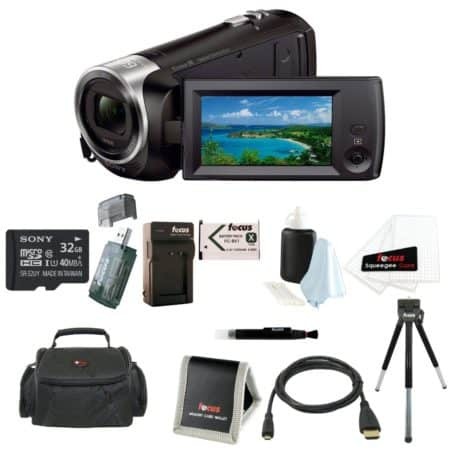 But given the sheer number of these products on the market, how can you tell which specific camcorder is best for you? Well, that’s where we come in. We’ve put together a list of some of the best camcorders on the market to help you find one that fits your needs and your budget perfectly. Check out the table below. It contains a list of all the products we’ll be discussing, as well as some of their important specifications. Bear in mind that we have a lot more to say about each of them, so don’t go making a decision just yet. Alright, now let’s briefly talk about our evaluation process. We take both positive and negative factors into account before making our final decision. This allows you to have a balanced overview of each model and will hopefully help prevent buyer’s remorse down the line. 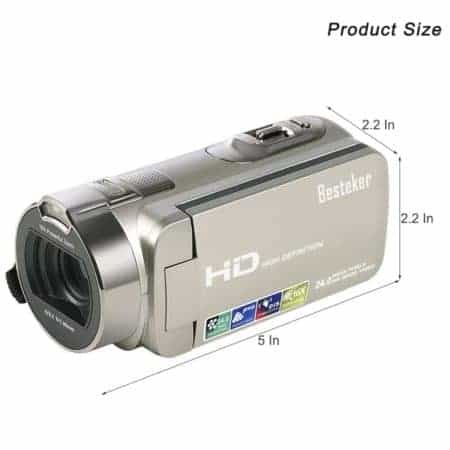 Now that’s out of the way, let’s begin with the least expensive product in our list, the Besteker HD Video Camcorder. 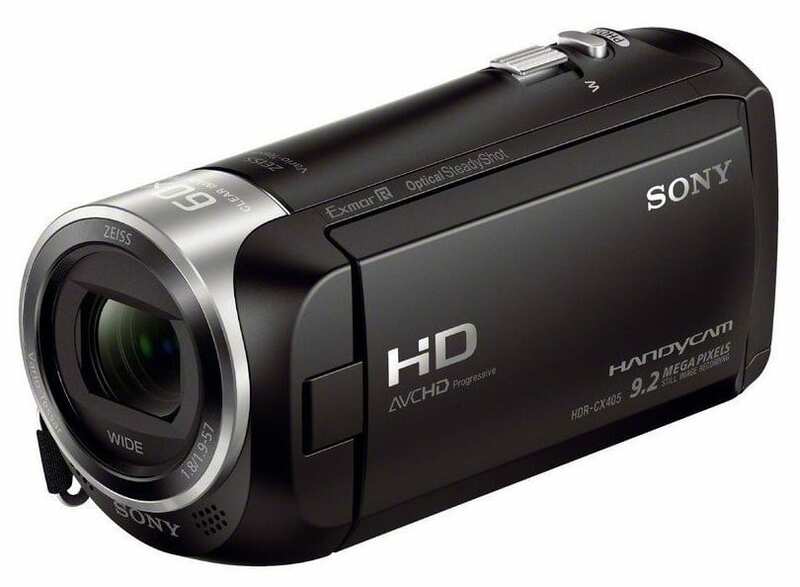 It turns out that you don’t have to break the bank to find a great camcorder. 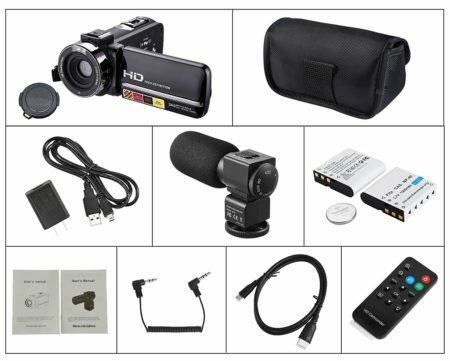 At less than $60, this product from Besteker can take care of all your filming needs. It can take high-quality photographs with its 24-megapixel camera, and shoot 1080p video for hours. Its internal battery takes around three hours to fully charge and provides up to eight hours of continuous usage. But that’s not all we like about it. There is a wide range of additional functionality. For instance, you can use the 16X digital zoom for situations where you’re slightly too far away for a good shot. The 3” display can rotate up to 270°, so regardless of your shooting position, you can see your footage as you shoot it, which is incredibly useful for those once in a lifetime opportunity. Get this: it also comes with face detection and anti-shake software, plus an automatic shutoff which conserves the battery power when not in use. How is it for connectivity, though? Well, it has its own internal microphone so you can pick up audio as well as video. On top of that, it has a USB 2.0 port and a set of jacks which allow you to view your clips on a big screen. Of course, you’re going to need somewhere to store all of your footage. This camcorder doesn’t have any kind of internal memory, so you’ll have to buy an SD card. Luckily, these are pretty inexpensive, however, there is one pitfall. The Besteker only accepts SD cards of 32GB or smaller. You could always bring a couple of them just in case, though. One of the great things about this camcorder is how small and light it is. It’s highly portable at just 5” deep, 2.3” wide, and 2.2” tall. Better still, it weighs just over one pound, so your arm won’t get tired after extended periods of use. Of course, since this model is so inexpensive, there are some downsides to it. For example, it’s made of fairly cheap plastic, so if you drop it, there’s a significant chance of it being damaged. While it’s good for day-to-day home movie-style footage, this makes it a poor choice for professional work or first-person sports recording. We can’t be too harsh on it, though. 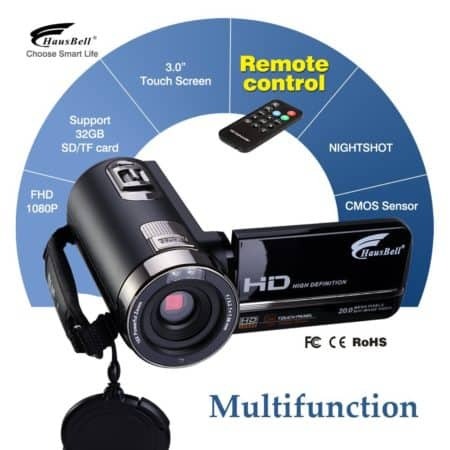 It provides good film quality for a very low price, and that’s commendable in itself. So, what are our overall thoughts? This camera would be perfect for someone on a tight budget who’s looking to document their everyday life. 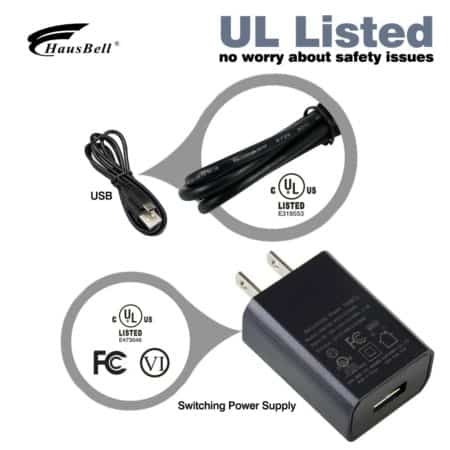 It has a good range of connectivity and even some more advanced features which you just can’t get if you’re using a cell phone camera. For under $60, you might not have been expecting much. 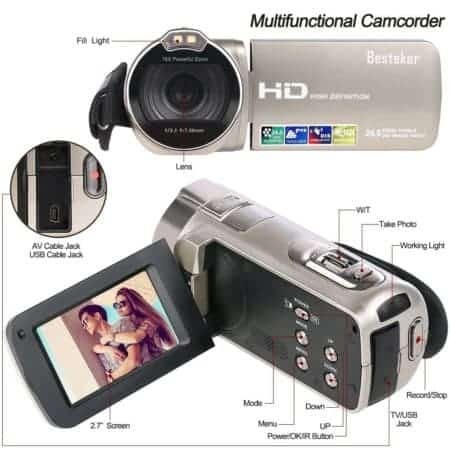 The Besteker camcorder is one product which under-promises and over-delivers, and we really can’t fault it for that. It’s a solid choice for anyone looking for their first camcorder. For a long time, if you wanted a camera that could get wet and survive being knocked around, you had to buy a GoPro. Thankfully, for those on a budget, there are now other options. 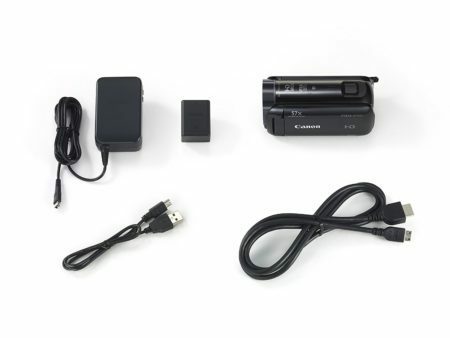 This camcorder from CAMKONG costs under $70 and provides much of the functionality that a GoPro does. For instance, it’s compact, mountable, and is waterproof up to depths of 100 feet. Let’s say you’re going to use it to shoot video of your kayaking trip. Your hands are going to be busy, right? 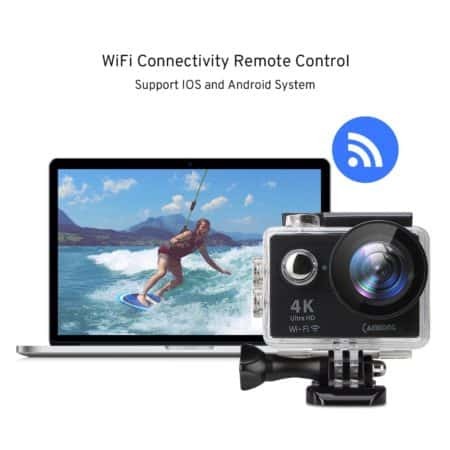 Accessing the camera is going to be a nuisance in this situation, so CAMKONG have provided a wireless camera controller that you wear on your wrist. You know you’re going to have high-quality footage too. This camcorder is capable of recording 4K footage at 25 frames per second (FPS), and 2.7K footage at 30fps. Of course, this comes with one big disadvantage. It means that the battery life is significantly shorter than some of its rivals. It does come with two rechargeable batteries, but these take three hours to charge and provide just 90 minutes of recording time. In addition to buying this product, you’ll also need an SD card. Like the Besteker, it accepts cards of up to 32GB. So what do you do when you’re shooting and rapidly running out of space? Well, if you have the dedicated mobile app, you can send images straight to your cell phone or tablet using WiFi. This app even gives you the option to control the camera remotely. There’s one more feature that makes this function invaluable, though. The wide angle lens on this camcorder captures everything in a 170° cone. Coupled with the remote control, this means you can appear in some truly stunning images with a little preparation. What else could you possibly want? Well, how about a strong burst mode? 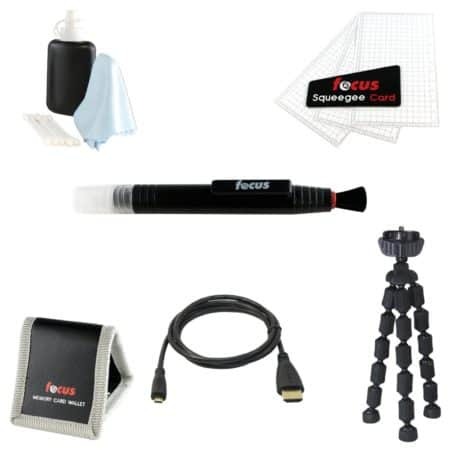 This product can capture 30 images every second in a range of different resolutions. Still, images start at 12MP, but you can go as low as 4MP to use less space. As this isn’t a handheld camcorder, it can afford to be very small. It’s just 2.4” wide, 1.6” tall and a single inch thick. Better still, it weighs just 2.2 ounces, so you can just throw it in your pocket as you head out the door. So far, so good, right? Taking all of this camera’s features into consideration, what’s our final verdict? 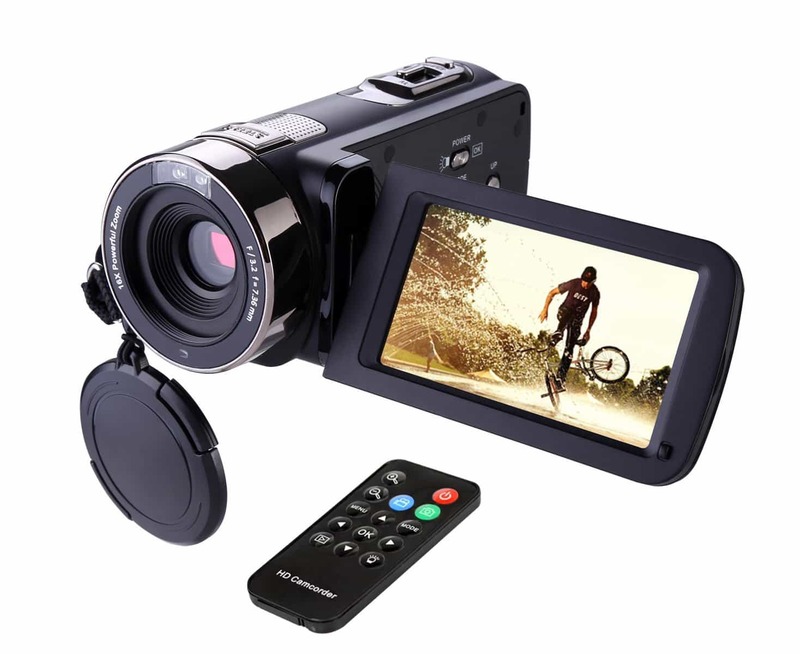 This camcorder is aimed squarely at people looking to capture footage of their active lifestyles. As a result, it’s perfect for hikers, surfers, and adrenaline junkies who want to share their adventures with the world. The ability to control it remotely using a cell phone or the wrist strap is invaluable. 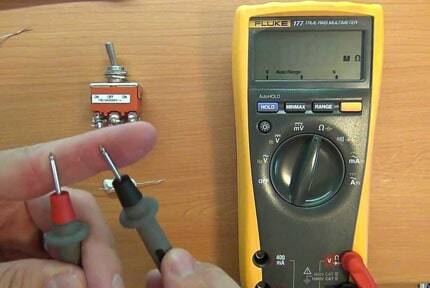 It allows for quicker access in those crucial moments and lets you focus on the task at hand. 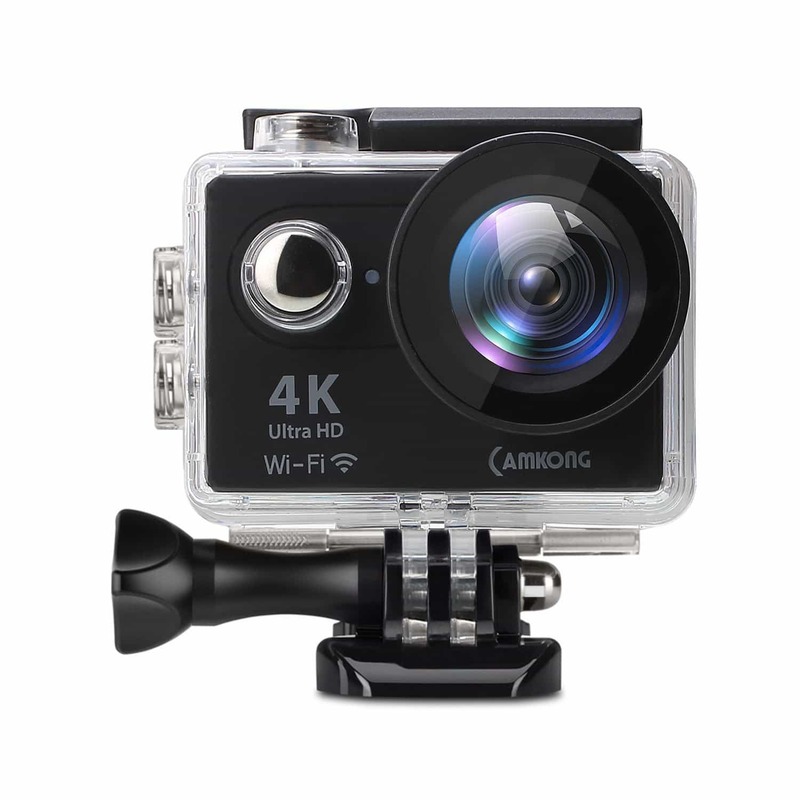 In short, if you don’t want to spend all that money on a GoPro, the CAMKONG is a great choice. Sometimes you need to film at night or in dark locations, and most ordinary camcorders can’t handle this. Even if they have a work light, there’s a good chance that they’re not going to pick up as much detail as you’d like. 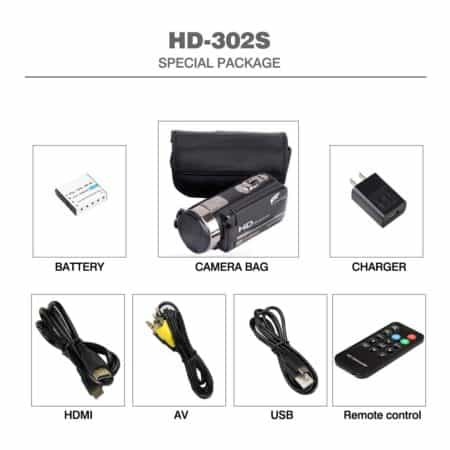 That’s where the Hausbell 302S FHD camcorder comes in. Get this: it has an infrared setting which allows you to shoot in night vision. So how much does this cost? There’s a good chance it’s less than you might think, at around $75. Considering this is a fairly advanced feature, that’s pretty reasonable. Of course, infrared filming requires a lot of power. Usually, you’ll get around 110 minutes of shooting for every three or four-hour charge, however, in night vision, this is reduced to just twenty minutes. This means that you’re really going to have to make the most of the time you have. You can buy additional batteries, but planning your shots will be essential. That’s not all we like, though. One of the great things about this model is its advanced features. There’s a 16X digital zoom, a 5MP CMOS sensor, and even a simplistic remote control which allows you to take photos and video from a distance. 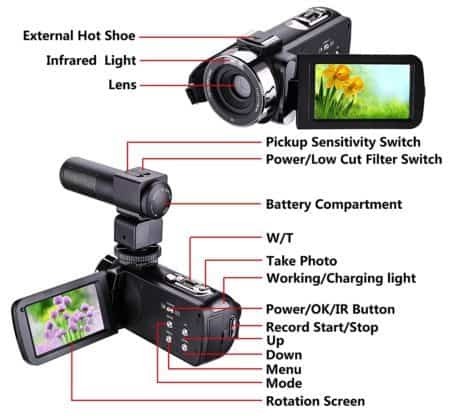 This lets you navigate the menus, change whether you’re capturing videos or still images, and even turn on the infrared mode. It appears to be quite cheaply made, but as long as it does the job, that’s all that matters, right? This model has a 3” screen which allows you to watch the video as you record it. We really liked that this is a touchscreen, allowing you to quickly start or stop just by tapping it. This screen can also be rotated by up to 270°. 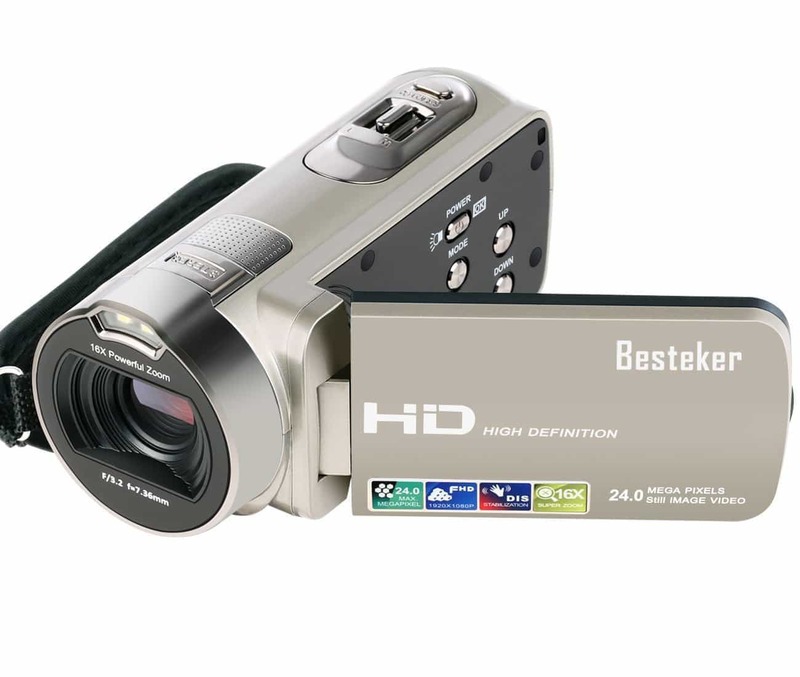 This is a full HD camcorder and can capture 30fps 1080p footage and 20MP images. As with the other products we’ve seen, you’ll have to buy an SD card first. These are pretty cheap, but you’ll need to get one that’s 32GB or lower. 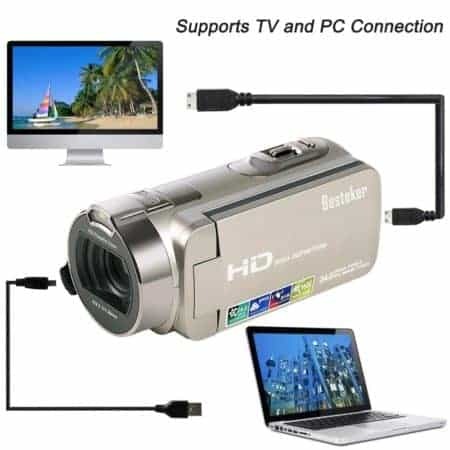 This camera also provides an easy way to view your content on the big screen: it can connect to a TV using an HDMI, AV, or USB cable. Taking into consideration all we’ve learned about this product, it’s fairly clear that it provides functionality that none of the less expensive models do. The battery life when using infrared is an unfortunate side effect, and we’d really have preferred if you got half an hour at least, considering how long it takes to charge. Despite this, we find that the 302S FHD is a product that’s well worth its slightly higher price tag. It may not shoot in 4K, but the 1080p footage comes across very clearly. There are a whole lot of camcorders that record gorgeous, crisp images but completely forget about the audio. This camcorder from Onshowy is not one of these. 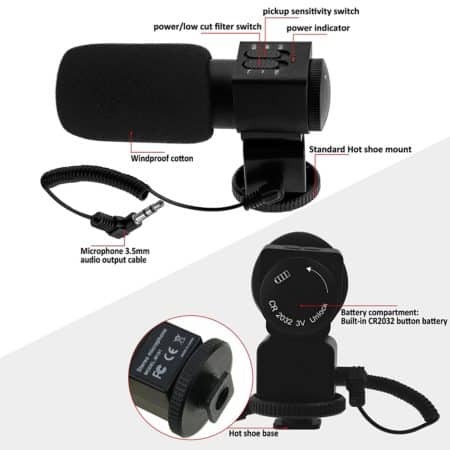 In fact, it comes with its own attachable microphone which can be angled straight at whatever you’re filming. 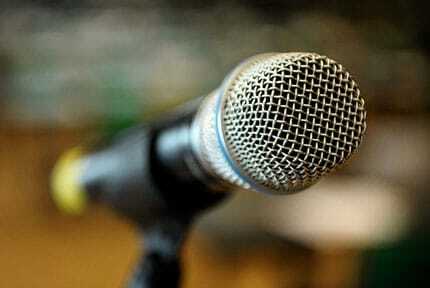 This mic has its own battery, which should last for around 60 hours on a single charge. It probably goes without saying, but the audio that this camera captures is head and shoulders above anything else in this price range. As you might expect, it’s a little more expensive, costing around $120. It’s well worth the price, though, as you’ll soon see. First of all, the footage it captures is decent, but not incredible. It’s fairly standard 1080p footage, although it does get just 15 fps instead of the standard 30. Its still images are solid, though. They’re captured with a resolution of 16 megapixels, and there’s even an included tripod to help prevent the camera from shaking. There’s also the option to use digital zoom. It can enlarge images by up to 16 times, but this does tend to make your pictures grainy and a little unnatural looking. This is less useful than you might think, though, since this camcorder comes with built-in anti-shake technology. 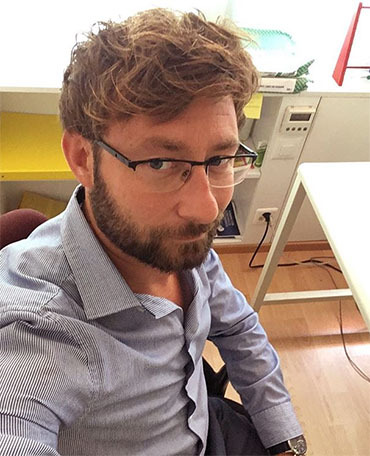 It can also detect faces automatically, which is great and can really help your framing. This camera also allows you to shoot in low-light conditions, and as before, its battery life is drastically shortened when doing so. You can expect to get around 20 minutes from each battery. What about the attached screen? Well, it is fairly standard. It’s 3” in size, can rotate 270°, and can be operated by touching it directly. This combination of features makes it easy to use whether you’re holding the camera normally or even above your head. Given this product’s higher initial cost, we’d really have liked to see it include an SD card. They aren’t expensive, but it’s just extra money you’ll have to spend. This model supports cards from 4GB to 32GB in size, and although it has a USB port, you can’t use an external hard drive to store anything. So who would this camcorder be best suited to? Well, if you’re the kind of person that likes to record audio at concerts or speeches, this model is right up your alley. In these situations, this camera’s lower frame rate isn’t going to make much of a difference. It does mean that if you’re interested in capturing video of sports or animals, you may be better off with a different model, though. 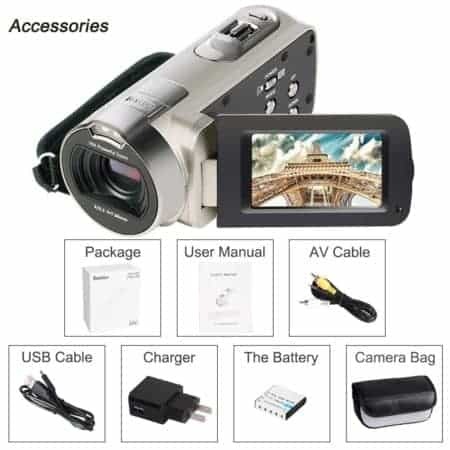 For general everyday use, or for capturing slow moving objects with a focus on audio, there are very few camcorders on the market that can compete with this one. If this sounds like what you’d like to capture, then you may have just found the perfect product. Okay, so the products we’ve seen so far have generally had one area they excel in, but the Sony HDR-CX405/B is a more general use model. There is a downside, though: it’s fairly expensive. 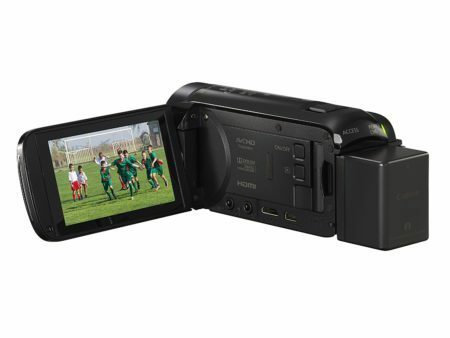 It can be hard to justify spending almost $230 on a camcorder, so how does it hold up? Well, first of all, it has a wide angle lens so you can capture large groups of people in one shot. This lets you take in more of a scene than most of its competitors, so that’s always good. The footage is slightly better than normal too. It captures 1080p video at 60fps and saves it as an MP4 file. This format is supported by all of the main operating systems, so regardless of whether you’re using Windows, MacOS, or Linux, you’ll be able to access your files. One of the best things about this camcorder is its extensive zoom functionality. It has 30X optical zoom, which is already pretty significant, but it doesn’t stop there. It uses Clear Zoom technology which allows you to simulate 60X digital zoom with minimal degradation. There’s also a frankly ridiculous 350X digital zoom, however, there’s a real problem with it. Digital zoom just attempts to enlarge the pixels of whatever is on screen. At 350X digital zoom, whatever you’re trying to film will be a blurry, indistinguishable blob. There’s really no reason to use this over the pretty solid optical zoom. That isn’t all of the included tech, though. There’s also a sophisticated three-way anti-shake feature, face detection, and an intelligent automatic setting which selects the best settings for any scene. This camcorder, unlike all of the others we’ve seen, comes with a 32GB SD card. Also included are a hand strap (which contains a hidden USB cable), a tripod, and a carry case. However, it’s not all good news. There are a few commonly seen features that this model doesn’t have. For instance, there’s no built-in WiFi and no work light. These would really help increase this product’s versatility, and given its higher price, we’d really have liked to see them included. It is pretty small though, so it’s highly portable. It measures just 5” deep, and a little over 2” wide and tall. Additionally, it weighs just under seven pounds, so your arm won’t get tired holding it for long periods of time. So who is this camcorder best suited to? 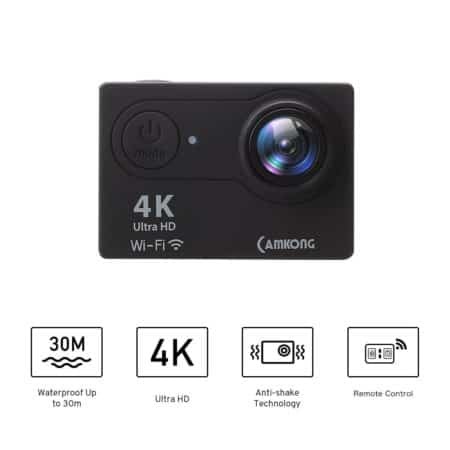 We’d say that if you don’t know what sort of situations you’ll be in and are looking for a camera that can handle most things reasonably well, this would be a strong choice. Of course, it’s not perfect. It can’t shoot in low-light conditions, and it can’t connect to a cell phone, which is a real shame for a product of this caliber. The VIXIA HF R72 from Canon is an expensive camcorder, but one that’s well worth the money. It costs around about $300, and at first glance, it seems fairly standard. A 3” touchscreen, 1080p video, and a decent aesthetic. So what makes this product worth its higher price? In short, the additional features that it boasts. Take the optical zoom, for example. Most of the time, a camcorder will offer 30X optical zoom, but this one can go as high as 57X. Better still, it has stabilizing technology to keep your target in sight from such a distance. It also comes with a built in NFC chip and WiFi capabilities. These allow for easier sharing of footage and images, but there’s also another attraction here. Basically, if you download an app onto your cell phone or tablet, you can watch the footage live, as it’s being recorded. This works regardless of whether you’re on the same network or not too, which is great. There’s also a slow motion mode, a fast motion mode, and file locking functionality, but there’s one feature that is truly invaluable. It has something called “Baby mode”. What this mode does is film everything in three-second increments. When you hit the capture button, you get everything from the previous three seconds as well as the rest of your video. As you might expect, this mode is perfect for capturing babies or other unbelievable moments. Believe it or not, there’s more. 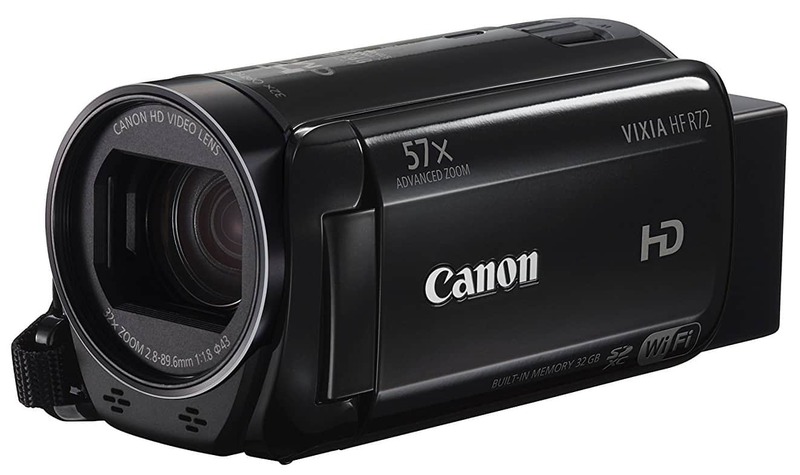 This is one of the smallest camcorders around, although it is ever so slightly heavier, at 8.5 ounces. It’s less than 5” deep, and just a little over 2” tall and wide, which makes it perfect for throwing into your glove box. However, there is one glaring and obvious issue with this product. Although it’s the most expensive on the list, it has the lowest number of megapixels. The images this camera can take are still of an excellent quality though, owing largely to its high-quality CMOS sensor. There’s more to image quality than just megapixels, and we’ll explain this in more detail later, but suffice it to say that you’re not going to be disappointed by the footage you shoot with the VIXIA HF R72. We know that not everyone is going to be able to justify spending this much money on a camcorder, and that’s alright. Those who have the budget for it, however, will find that it’s a great little camera and one that’s very versatile indeed. Before you spend any money on a new camcorder, there are a few things you’ll have to think about. There are the more obvious things like picture quality, but also certain physical aspects which have a large effect on your usage of the model. Luckily, we’ve put together a short guide to these influencing factors to help you find the product that’s best for you. A lot of people think that a camera with a higher number of megapixels will automatically take better photos and video, but that’s not entirely true. Whilst it is true that the photos have the potential to be more detailed, the camcorder’s sensor is more important. The size of the sensor is crucial – a larger one lets in more light and therefore, can capture richer, truer to life colors. Although this guide refers to cameras, that’s all a camcorder really is, and it goes into a more thorough explanation of lens specifications than we have time for here. It’s a must-read piece for anyone interested in capturing better footage. There are two kinds of zoom, optical and digital. Optical zoom changes the focal length of the camera’s lens and actually zooms in, whereas digital zoom simply enlarges an image’s pixels to several times their initial size. As a result, digital zoom can cause crystal clear images to turn into blocky, unrecognizable messes with no real detail. For this reason, its practical applications are severely limited. If given the choice, you’d be best to choose a camera with a strong optical zoom over digital zoom functionality. Given that all of the products we’ve seen today have their own strengths and weaknesses, it was difficult for us to choose one product which was definitively better overall. Nonetheless, it’s a difficult job, but someone has to do it. 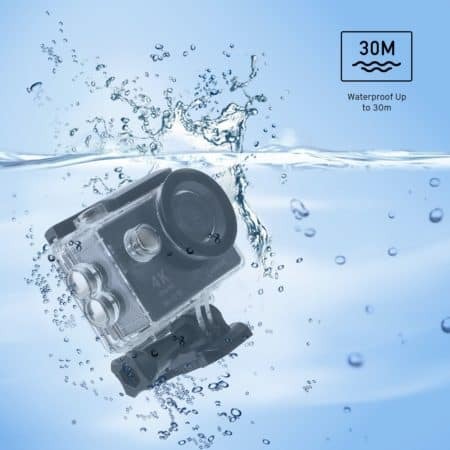 We’ve come to the decision that the CAMKONG Wifi Waterproof Sports Camera is likely to appeal to more people than any of the others. Firstly, it’s waterproof, which increases its range of uses by leaps and bounds. Secondly, it’s relatively inexpensive, and costs under $70, so it’ll fit most people’s budgets. 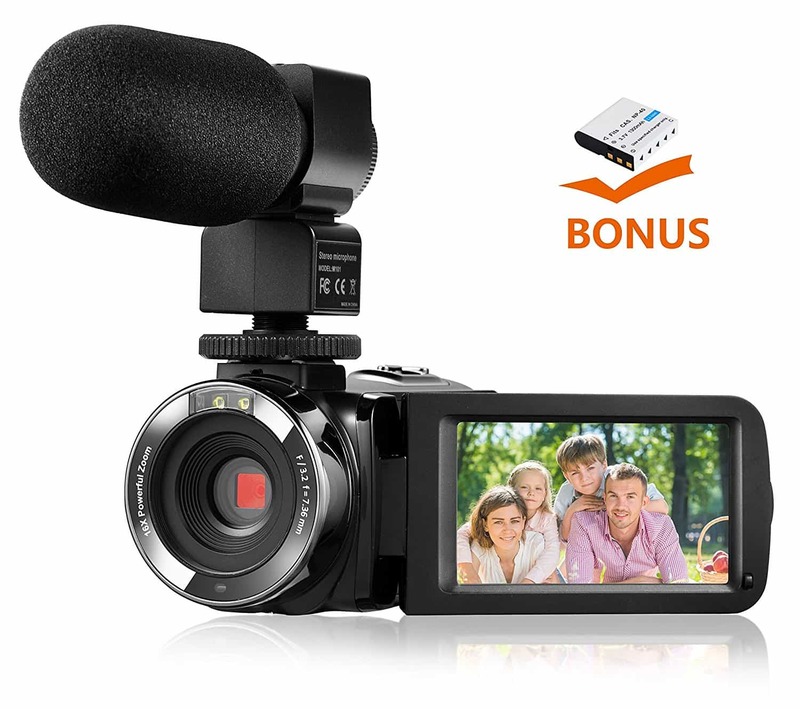 If you want the most bang for your buck, this is the camcorder to go for.